Little Hope. 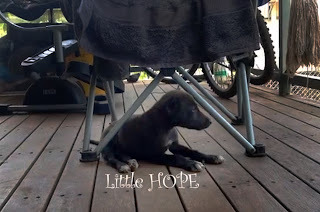 An apt name and certainly first impression of the fate of a little puppy rescued from abuse, disabled but alive, extricated to the sanctuary and care of my friend Craig Danver's home on Elcho island, NT. Craig is a Videographer, among other things, and the first heartrending clip he put together of his rescued pup "Meet Hope" was extremely hard for me to watch. Most people I shared it with shed a tear, both in sadness and in anger at the terrible cruelty that humans can inflict upon defenceless animals. You may find this clip distressing if you love animals. Discovered hiding under a house after being abused, little Hope was fortunate enough to escape with her life but not the use of her rear legs. Originally destined to be put down she had so much desire for life that Craig could not help but take her on. This first video he took, although distressing to watch, shows an innocent pup, happy to be in a safe caring environment and exploring enthusiastically almost unaware of its crippling disability. 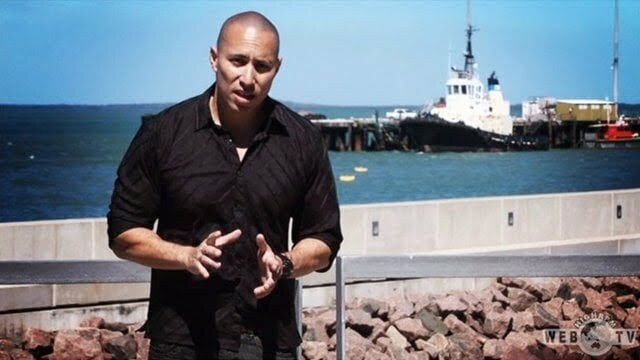 When Craig first showed me the video of his new charge he was sure to make me aware that it was accompanied by a second clip, one that he was excited about and one that was intended to show me what he had planned for Hope from the moment he had rescued her, to improve her life to the best of his ability. By a lucky twist of chance for little Hope, Craig is also our technical consultant at HighRPM, he is a man who enjoys imagining, designing & building all manner of things, electronic or mechanical, we often come to him for solutions for anything from sound and video formats to camera rigs and flying camera platforms. Here is the heart warming clip of version 1 of the 'wheelchair' rig that Craig built for her to let her get around under her own steam. In stark contrast to the first video it is such a pleasure to watch the obvious enthusiasm and joy the little dog gets from running around with her family. It has been almost nine months now since those first two videos and Hope is now as regular a dog as a pup-with-wheels can be. She has no fear according to Craig and likes to run just as hard as the other dogs in their family. Due to her condition she can't bend her back legs so the latest modification of her wheelchair design has been customised to suit her now longer rear legs. The video below is from her 3 days trying out the new wheels, since then she has adapted well and doesn't tip over quite so often now. The wheelchair is made from a children's stroller and some pvc tubing from Bunnings, some zip ties and a dog harness from Pet Barn. It is zipped tied together instead of glue to give it some flexibility to absorb the bumps, turns out that was a good choice as she pushes it hard.